Granny squares never looked so chic and classy as the demure renditions in this sophisticated little cardi that is the perfect day-to-date wardrobe piece. 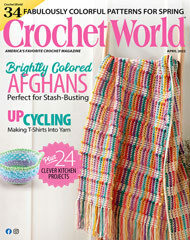 This e-pattern was originally published in Easy-Living Crochet. Size: Includes Woman's S through 2XL. Made with size 3 crochet cotton thread and size C (2.75mm) hook.